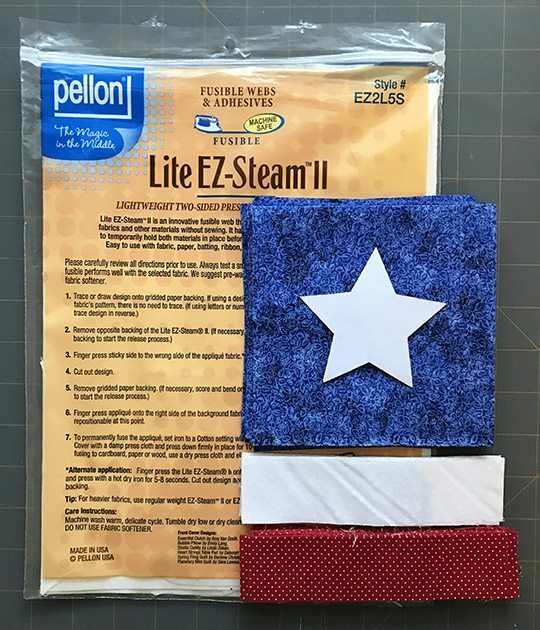 I’ve had a couple ideas for a red, white & blue table runner sketched out in my notes for a while, but couldn’t make up my mind on which one to try first. 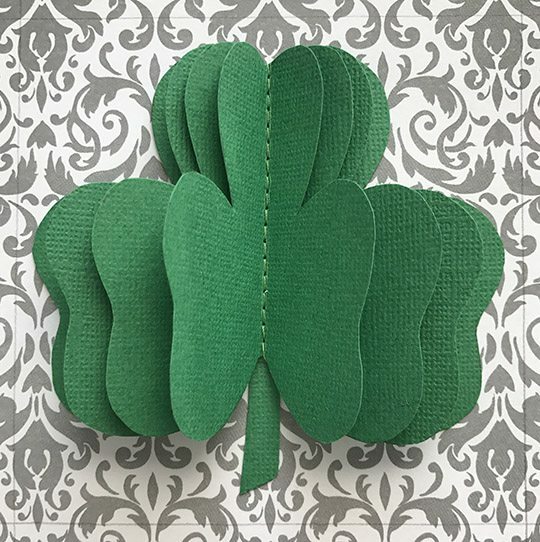 When I pulled out my fabric bins and started playing around with options, this is the version that won out. 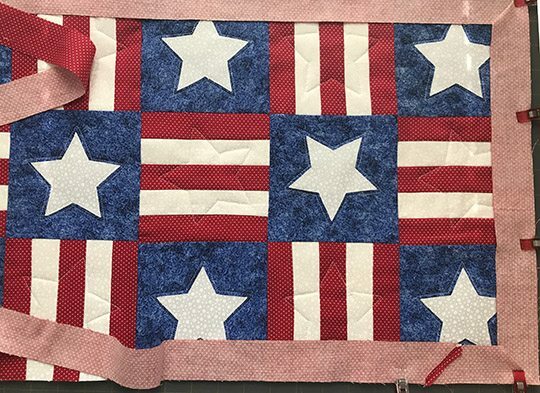 It’s a combination of pieced stripes and appliqued stars, with a little fancy quilting thrown in. Print out the star pattern. 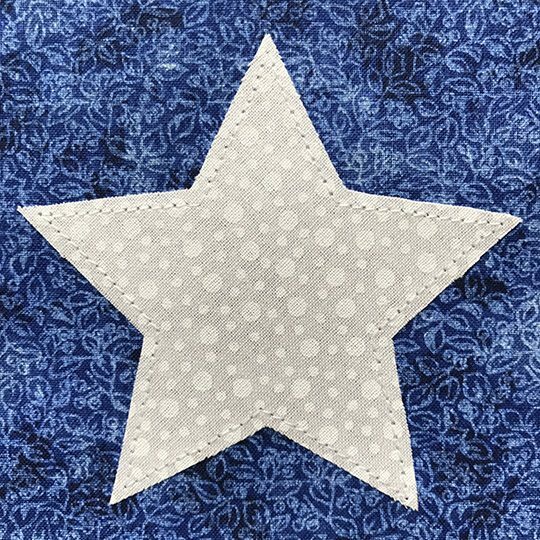 Note there are two pieces to the pattern: a single star, which is used for the white star shapes, and a half star in a box that’s as a placement guide for the star appliques. Trace 11 star shapes onto the paper side of a sheet of double-sided iron on adhesive. Apply the adhesive to the wrong side of the white fabric following the manufacturers instructions. 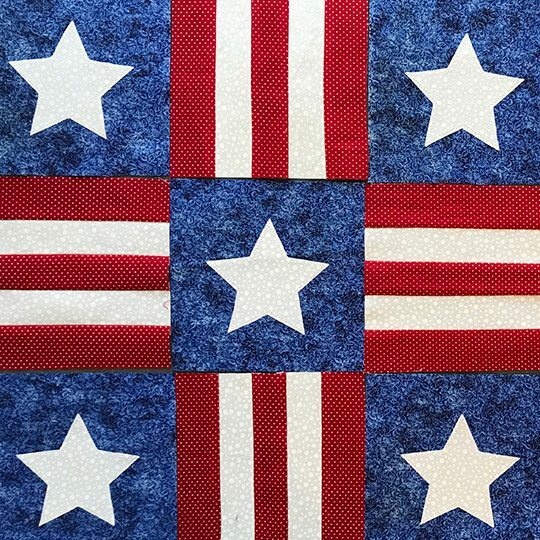 Cut out the stars and center one star in each of the blue squares, using the placement guide to line them up. 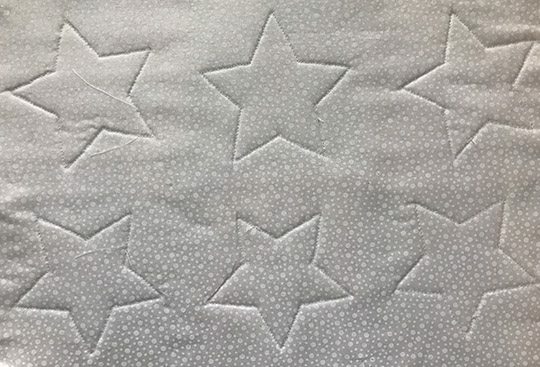 Iron the stars into place, following the manufacturer’s instructions, then topstitch around the inner edges of the stars. Sew 20 of the white strips and 20 of the red strips together in pairs. Sew the pairs together, alternating red and white strips, to make 10 red and white blocks. 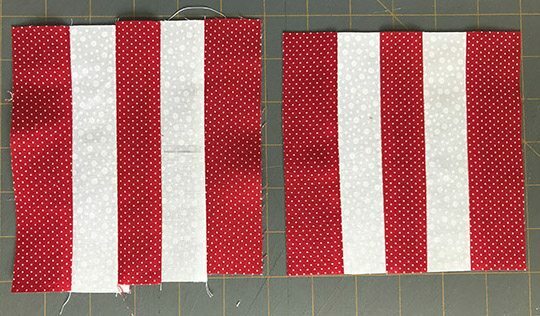 Add the remaining red strips, sewing one to each of the 10 sets. 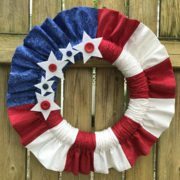 Trim the red and white striped blocks down to 5-1/2″ x 5-1/2″. Lay out the blocks. 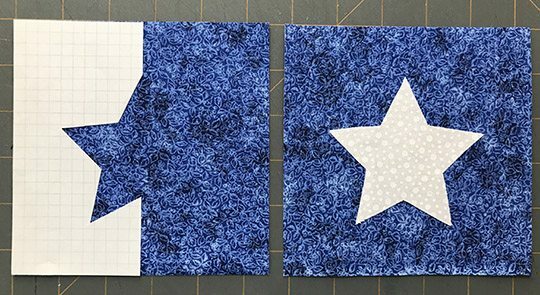 I alternated the direction of the striped blocks and rotated some of the star blocks so they weren’t all going in the same direction, but that’s my personal preference. 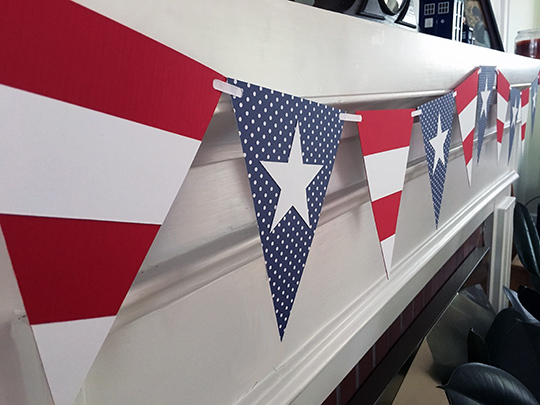 If wonky stars and alternating stripes bother you, turn them all in the same direction! Sew the blocks together. 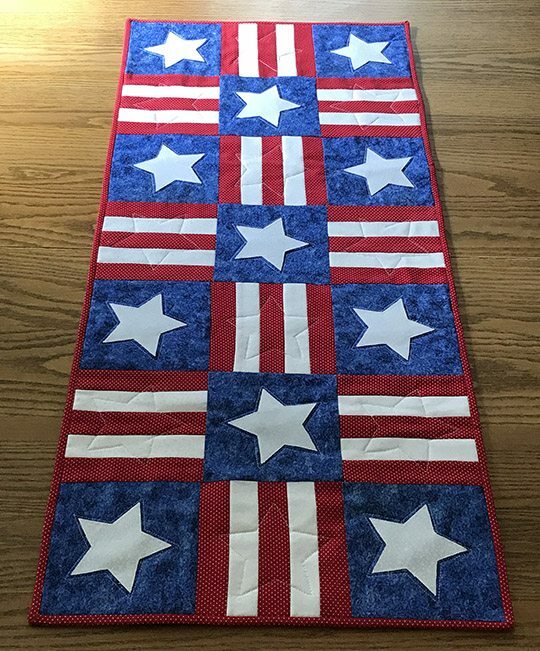 I found it easiest to sew each three-block row together, then sew the rows together. Square up the blocks and trim if needed. 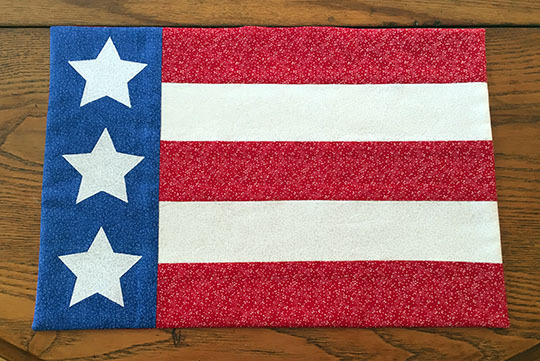 Cut a rectangle from your batting and backing fabric, each 16″ x 36″. Lay the backing fabric on your work surface, wrong side up, with the batting on top. Center the table runner top on the batting, right side down. 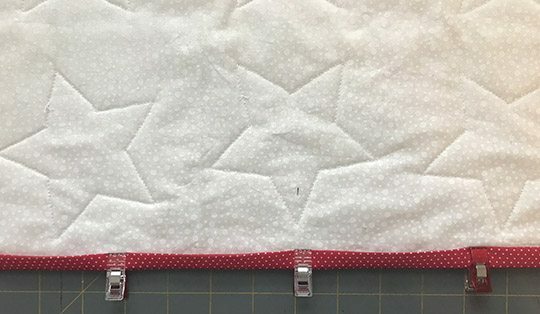 The batting and backing are just slightly larger than the runner top to allow for minor shifting when you quilt it all together. Pin baste through all the layers. 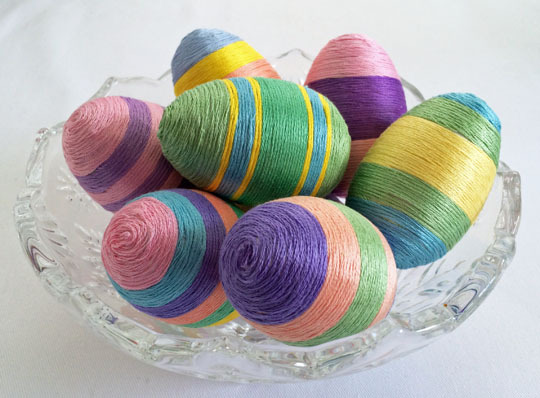 Now it’s time to quilt the layers. 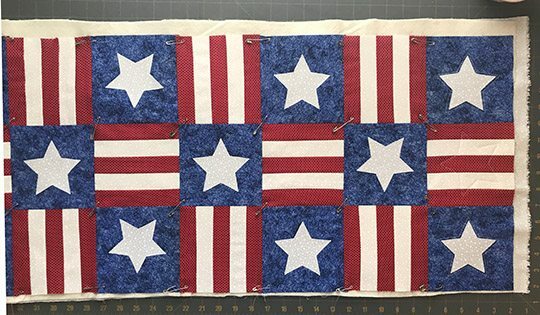 You could use straight or diagonal lines if you’d like, or do what I did and quilt stars. 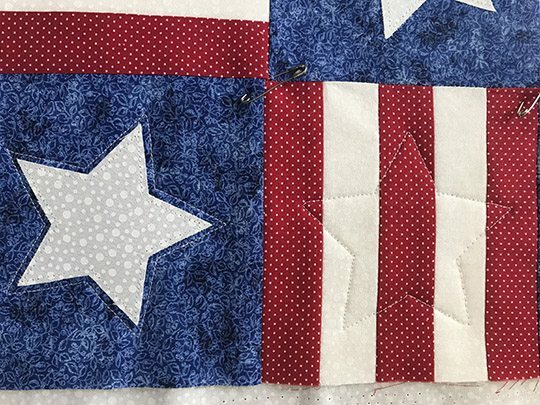 I quilted about 1/8″ around the outside of each of the white stars, then used the original paper star pattern as a guide and quilted about 1/8″ around it to add a star to each of the striped blocks. Trim through all the layers to cut away the excess quilt batting and backing. From your remaining red fabric, cut strips 1-1/2″ x the width of the fabric for binding strips. 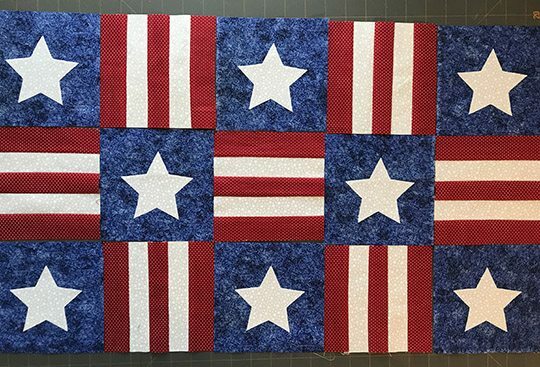 Join the strips together at the short ends to create one strip at least 114″ (9-1/2′) long. Pin the binding around the top of the table runner, right sides facing. Stitch the binding in place, then press it toward the outside edge of the runner. Flip the runner over. Fold the raw edge of the binding in to meet the edge of the table runner, then fold again and pin in place, encasing all the raw edges. Love this one too. Thanks for joining us at the Inspiration Spotlight party. Shared.